The brutality of Christopher Nolan’s Gotham City became horrifyingly real during a midnight screening of The Dark Knight Rises in Aurora, Colorado as a gunman burst into the theater and murdered at least 12 people. And at least some in the theater initially thought the incident was part of the show. 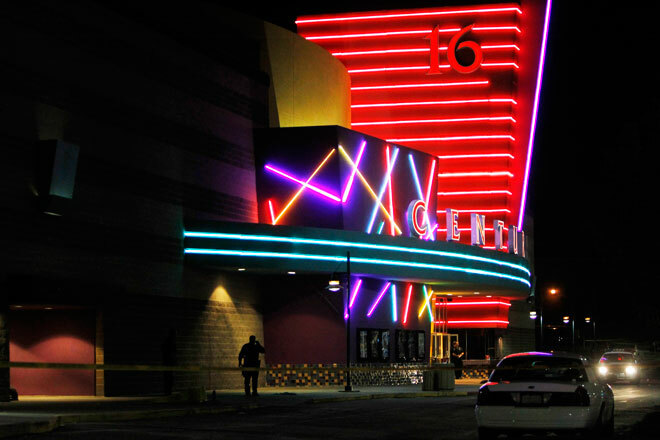 While information about the massacre is still sketchy — there’s a Reddit page compiling a timeline of the attack — early reports indicate that a man wearing a gas mask and body armor and carrying a rifle burst into the ninth theater at the Central 16 cineplex in the Denver suburb. Entering from the emergency exit, he threw what witnesses described as a gas canister before beginning a shooting spree that wounded about 50 people — at least 12 fatally. “We were just watching the movie and up to the right it sounded liked some firecrackers went off,” Zachary Golditch, who was seeing the movie in the nearby Theater 8, told local TV news. Golditch was shot in the neck, “a clear in and out wound,” as the chaos spread to theater eight. Another moviegoer in Theater 8, Alex Milano, told a reporter that “loud bangs and smoke took over the right of the theater.” Before he realized he was under attack, Milano said he and a friend thought, “Special effects, midnight showing, that’s awesome, what theater does that anymore.” But when he saw “something come through the wall, multiple objects flow through the wall,” he dropped his younger sister and himself to the ground and spirited them out of the movie. 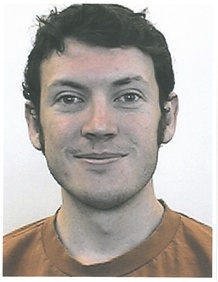 Police announced that they have a 24-year old man in custody named James Holmes. A dropout from a neuroscience Ph. D program, his motives are as yet unknown — but became the subject of quick, rash speculation on the Twitter hashtags #aurorashooting and #theatershooting. where people used the tragedy to promote their agendas on everything from gun control to counterterrorism. Twitter became a portal into the tragedy, as cellphone videos filmed from the theater circulated alongside outpourings of support for the victims and rage at the crime. The social-media fracas even prompted an area man who shares a name with the suspect to compose a Facebook post explaining, “I am not a 24-year old gun-slinging killer.” Already, a Facebook group assembled urging the “death penalty” for a suspect who as of yet has not been charged with the crime. On the other end of the spectrum, the survivors of the attack also shared their experiences on social media. 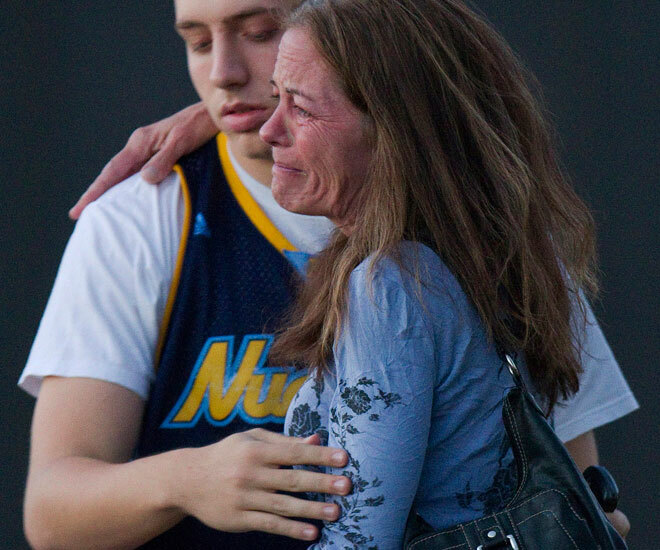 One Redditor, calling himself themurderator, posted pictures — warning: graphic — of what he described as his gunshot wounds from the Aurora shooting. Warner Brothers released a statement extending “our sincere sympathies to the families and loved ones of the victims at this tragic time.” It has cancelled the red-carpet premiere of The Dark Knight Rises in Paris. While fears of sophisticated domestic terrorism have circulated since 9/11 — Nolan plays off them in his Batman trilogy — most mass killings in the United States still typically rely on a single individual or small group of people using assault weapons. From the Littleton Colorado shootings of 1999; to the D.C. area sniper rampage of 2002; to the Virginia Tech massacre of 2007; to Maj. Nidal Hassan’s Fort Hood attack in 2009, this pattern has held. The “complex attacks” familiar to the U.S. military in Iraq and Afghanistan — so-called because they combine insurgent tactics, such as homemade bomb explosions with small-arms or rocket fire — have still not migrated back to the United States. But Aurora might be an intended exception. As of 11 a.m. EST, TV news is reporting that police on the scene have evacuated buildings near Holmes’ apartment building because of suspicions the building is booby-trapped. MSNBC is saying Holmes himself, in custody, told police about the suspected boobytraps himself. Should these boobytraps turn out to be actual bombs that go off outside a controlled explosion, then that would probably count as a rare complex attack inside the United States. Police have surrounded Holmes’ building, described as containing incendiary or explosive material, as of this writing. And it may be a coincidence, but the Joker in Nolan’s The Dark Knight also booby-trapped buildings that he lured police (and the Batman) toward. If it’s more than a coincidence, it would follow earlier incidents of killers copycatting comic-book and movie violence. In 2009, an Army specialist stabbed a fellow soldier while painting his face like the Joker before police shot him to death in Shenandoah National Park. That same year, a Belgian man also dressed like the Joker went on a stabbing spree at a day-care center. Many years earlier, a serial killer in New York cited the Robocop franchise as inspiration for his murders. Sophisticated terrorist attacks like 9/11, where multiple teams of terrorists synchronize an assault, remain the exception, not the rule. It’s notable as well that the homegrown attacks encouraged by the web magazine of al-Qaida’s Yemen offshoot are more grandiose than killing moviegoers; none have manifested yet. The U.S. Army, concerned over speculation that the shooter might have been a veteran — and eager to stifle the meme of the psychotic veteran before it spread — felt compelled to email that a database check of the suspect resulted in “no evidence suggest[ing] this individual served in the Army.” Spokespeople for Buckley Air Force Base, near to Aurora, said servicemembers were among the wounded – four of them, two from the Air Force and two from the Navy, according to NBC News’ Jim Miklaszewski. Christopher Nolan’s third Batman film is based in part on the 1993 comic-book saga “Knightfall,” in which the psychopathic villain Bane subjects Gotham City to a campaign of escalating violence as a plot to lure out and cripple an exhausted Batman. In Aurora, the story came far too close to reality.